Custom, handmade clothes are especially fashionable today. It seems as if it keeps the energy and warmth of hands that had fabricated it. There is a vast variety of yarn of all sorts and colors on the market. All you have to do is to find buyers for your products. There is no better way to do that than launching an online store. You will be able to reach even the customers overseas. Currencies and languages are easy to change according to their needs. Yarn images look fresh and bright over the white background. The template has either horizontal or vertical navigation. Promo banners are both on top and at the bottom of the web page. 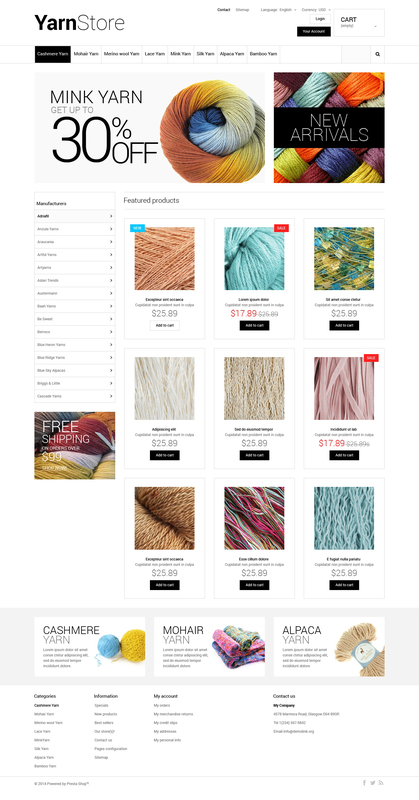 Choose this theme for your yarn store and the needlewomen from all over the world will become its loyal customers.